Kilbride’s success story is in many ways akin to that of the Phoenix. Rising from their status of a humble junior club to become Meath’s most feared football team and their amazing record gaining them respect all over the county and country. From the early years of the association there has always been a team in Kilbride, with the present club re-formed in 1948. Little success came in the 50′s, but 1960 marked the start of a remarkable period for Kilbride. Kilbride won the 1960 Junior Championship, added the Intermediate Championship in 1962 and in 1964 won the Senior Championship. This was an amazing feat for such a small club in such a short space of time. During the period 1960-71 , Kilbride won 1 Junior Championship, 1 Intermediate Championship, 5 Senior Championships ( + twice runners up ) , 3 Feis Cups and numerous tournaments around the country. 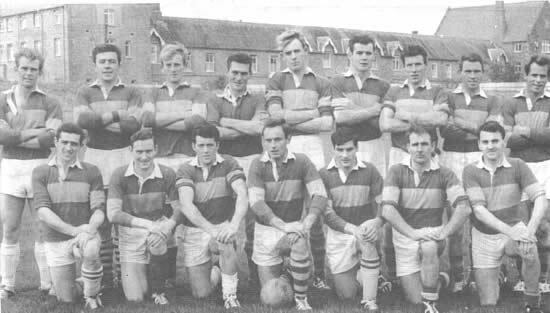 Left to right – Back : P.Reilly, M.O’Sullivan, Jimmy Quinn, J. O’Sullivan, M. Quinn, Jack Quinn, P. Rooney, T. Mahon, S. Hickey, Front : C. O’Sullivan, A. Reddin, P. Clarke, G. Quinn, P. Bruton, O. Sullivan, W. O’Sullivan. In 1960, there were victories over Ratoath, Clonard, Syddan among others on the way to the Junior Championship final proper against Batterstown. In the weeks preceeding the final there was lots of activity in the parish. Flags, hats and rattles were obtained and when the great day arrived flags fluttered from every gatepost and cars travelling to Navan were bedecked in green and red. The game itself was not a great one and Kilbride ran out easy winners with captain Martin Quinn raising the Royal Meath Association Cup. When the team and supporters arrived back in Kilbride, they were met with a blazing bonfire in the small village square. The local people danced and sang into the early hours of the morning to the music of an accordian. One old gentleman was heard to say ” It will twenty years before we see the like again “. Little did anyone know how that this was only the start of it all. Back row , left to right : P. Lynch, PJ. Reilly, J. Sweeney, M. Quinn, Jimmy Quinn, Jack Quinn, P. Rooney, A. Reddin, M. O’Sullivan, T. Mahon, O O’ Sullivan, K. Sutton, J. Marmiam, Front row : D. Colfer, O. Sullivan, P. Clarke, O. Reilly, G. Quinn, C. Reilly, O. Sullivan ( Capt ) , E. O’Sullivan, J. O’Sullivan, J. O’Neill, S. Hickey. In 1961, Kilbride lost to eventual winners Drumree in the Intermediate Championship. 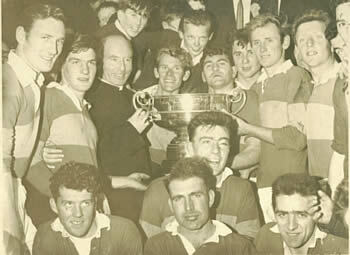 They were back in 1962, beating Walterstown in the final to become Intermediate Champions. Captain Owen O’Sullivan lifted the Royal Meath Association ( London ) Cup and once again excitement knew no bounds. In 1963, Kilbride won the Feis Cup and had their hopes dashed by St. Vincents in the semi finals of their first ever Senior Championship campaign. 1964 proved to be a momentous year for the club. The team led by Wardie O’Sullivan retained the Feis Cup and also made their way through to the championship final. Could Kilbride make their first appearance on the S.F.C. final a successful one. The training was hard, the well wishers from neighbouring clubs many and football fever high. The October final proved to be a great triumph for a small club with Gaeil Colmcilles being beaten by three points. Kilbride were senior football champions of Meath, and the dedication of the players, their determination to succeed, will to win and unyielding spirit had gained it’s just reward. A new football force had arrived. The Keegan Cup was paraded around the town of Navan and then taken home to an overwhelming reception. In 1965, Kilbride again reached the Final of the Senior Championship and were pitted against rivals Skryne. This match would go down in folklore because of one incident. Kilbride full back Martin Quinn was coming out of defence with the ball, when he was tackled by two Skryne men. Martin felt that tackling on him from the two Skryne players was over the top. The Referee then blew his whistle, not for a free out but for overcarrying the ball. At this point it’s fair to say that Martin, lost the head and as a result the referee sent him off. That should have been the end of the matter except that Martin sat on the ball and refused to leave the pitch. There was no man brave enough to attempt to take the ball back so the game was abandoned. At a county board meeting, Skryne were awarded the title by default and in their roll of honour, included is the 1965 Senior Championship. In 1966 Gaeil Colmcilles were crowned Senior Champions after it took three exciting matches with Kilbride to decide the match. 1967 was a great year for the club, winning the Senior Championship by beating Navan O’Mahony’s in the final, and Meath winning the All Ireland with 6 Kilbride men on board. Jack Quinn was voted the Meath Personality of the year. 1968 saw the Feis Cup return to Kilbride. 1969 started the great three in a row of Senior Championships with the team captained by Austin Reddin, defeating old rivals Skryne in the final. The following year it was Owen O’Sullivans turn to lead the green and reds to glory with O’Mahony’s overcome in the final, while in 1971 Pat Bruton led the team to ultimate victory with Skryne again the final victims. Since 1971 no championship has come to Kilbride. Kilbride were fortunate that 15 or 16 lads grew up together who were keenly interested in playing football. A great sense of loyalty and comradeship built up between the players allied to a great team spirit, fierce determination and buring desire to succeed, qualities which added up to the making of the greatest little club in Ireland. Along with the players, the story would not be complete without the selectors and mentors who guided the club through this historic period : John Marmion, Kevin Sutton, Packey Lynch, David Colfer, Tommy Manning, Sean Rothwell and Kieran O’Farrell. A major factor in the success story of the Kilbride team of the 60′s was the Quinn brothers : Jack, Gerry, Martin and Jimmy. The Quinns of Kilbride are well known in GAA circles having given great service to Kilbride and contributing to a resurgence in Meath footballing fortunes in the 60′s. In 1962, Jack and Gerry helped Meath win the Junior All Ireland championship. By 1964, Martin, Gerry and Jack were established on the full Meath team which reached the All Ireland semi final beating Dublin and Kildare along the way. Ten days before the match, their father passed away. Meath lost to Galway, with Jack having a goal disallowed by Kerry ref Seamus Garvey. There was some consolation that year as the brothers helped Kilbride to it’s first senior championship. Kilbride had gone from small junior club to senior kingpins in four years. In 1965, Meath were put to the sword against Longford, but they were back in 1966, putting in a powerful performance to beat Down in the semi final with Jack and Gerry to the fore. Jack was now playing full back in Martin’s enforced absence. In the final, Galway deservedly won the match and Meath were disappoiinted not to have played to their potential. Meath were generally written off as a team but with some new players they came back strongly and beat Cork in the 1967 All Ireland Final. The six Kilbride men on the panel made it a double winning the Meath senior championship with Kilbride. Jack Quinn was voted the Meath Personality of the year in 1967. The Quinns helped Kilbride complete a hatrick of senior titles in 69, 70, 71 but no further titles with Meath. Jack continued to “lord it” at full back and become a household name throughout the country. His last great day came in 1975, against Dublin in the League Final. When he retired in 1976, it marked the end of a period where the Quinns had given sterling service to both club and county.